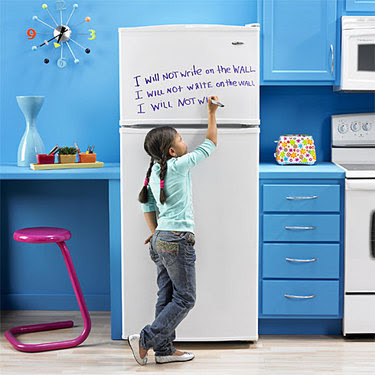 Amana's Jot Dry-Erase Refrigerator looks pretty neat. I found this pic it over at Cookie Magazine's Nesting Blog. (Not a magazine I subscribe to since it's geared towards moms that are so worried about other people's opinions that they don't think twice about spending a couple of grand on a stroller instead of putting that money towards a their child's education or perhaps donating it to a worthwhile cause. I mean seriously, what's wrong with people? They're going to use it maybe two years, why would you throw money away like that?!) Anyway, I digress, but I first read it about it over at Kitchen Design Notes. I like the concept, but most dry erase boards start getting that shadow effect...where you can't really erase the marker off of it anymore...after a while. I wonder how long this would work for, and what kind of warranty it had. I also wonder if you could just paint your fridge with dry erase paint and get the same effect. I think you could definitely do the dry-erase paint on the fridge and save yourself all but the $20 the pint of paint costs. I used the stuff on a huge wall in my house and ultimately painted over it because the texture of the wall wasn't smooth enough and I kept getting dry-erase dust in the little nooks and crannies. So if you happen to have one of those fridges with the slightly-textured finish, this might not work. But if the fridge is smooth, I say go for it! It looks like fun. oh, I stumbled here looking for help on cutting my Ikea counter. I think I have Numerar and my saw blade keeps getting hung up in it. Not sure why because the saw and the blade are both new. But I'm hoping to get a better blade tonight and get it cut. Thanks for posting all your pics. Things look great!